I know we’ve spoken about how to improve client communication before but I wanted to cover what, to me, are the main foundation blocks of great client communication. Yes, client communication is fundamentally talking to clients on a regular basis, but in my opinion it is far more than that. 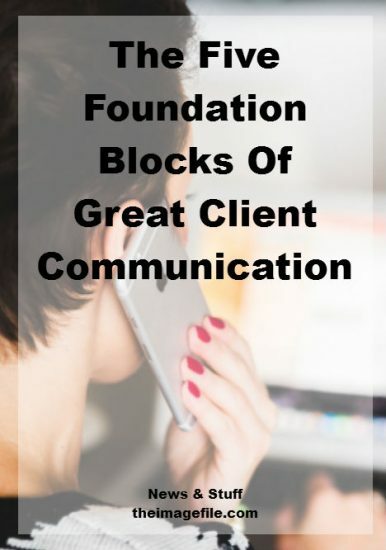 So here are my five foundation blocks to great client communication. With every relationship it’s important to be as open as possible. It’s best to have an open dialogue between you and your client. You need to know what clients expect from you and your company as well as telling your client what you expect from them, in terms of paperwork, information and client homework. Be confident in your skills, abilities and knowledge. If you see there are doubts on the client’s end then lead the relationship with fresh ideas and solutions. Don’t sit back and let the experience and relationship fester. Take the reins and dictate where the relationship is heading. You need to show clients that you are trustworthy and that their money and expectations are in good hands. This means providing paperwork when you say, turning up to meetings on time, being thorough and prompt with your emails and call-backs. You need to be dedicated to growing and maintaining the relationship. Don’t sit on your laurels and wait for them to come to you. It’s your responsibility to get in contact with the client, follow up on emails and phone calls and send thank you notes after the job is completed. Show that your clients matter and that their job, expectations and hopes are important to you. If they have concerns give them your time and reassurance, if they are confused then make sure they know that they are not bothering you with questions. Be kind and considerate with your time and knowledge. Prove that you care about them as a person, not just another enquiry. How do you set up client communication in your business?